Maximizing exposure of the home to the sun and reducing the impacts of winter winds are the primary site planning objectives in cold regions. Sites with south-facing slopes are advantageous because they provide maximum exposure to the sun while sheltering the home from the wind. Positioning the home low and locating it in a wind shadow -- the leeward side of a hill or other area protected from the cold, prevailing northwest winter winds -- will conserve energy. The structure itself can be designed with steeply pitched roofs on the windward side, thus deflecting the wind and reducing the roof area affected by the winds. Homes can be built into the hillsides or partially covered with earth and plants for natural insulation. Orient the home to face south or southeast. Locate living areas to the south and west sides of the home leaving the northeast portion for inactive areas like garages or storage rooms. North-facing exterior walls should be well insulated with few, if any, windows. To keep cold winter winds out of the dwelling, north entrances should be protected with earth mounds, evergreen vegetation, walls, or fences. Outdoor living areas should be located on the south sides of buildings to take advantage of the sun's heat. Walls or fences can be used to create sunny, protected areas on the south side of the home shielded from the wind. Deciduous trees or vines near the building will provide shade in summer and drop their leaves to allow the sun to enter in the winter. Evergreens or earthen berms on the northwest side of the home will protect it from wind year-round. Building materials should be medium to dark to absorb the sun's warmth, and the driveway should be crosswise to the winter wind. 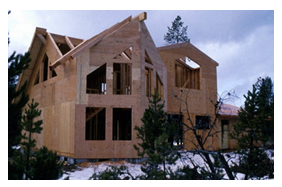 In cold climates, tight construction is particularly critical to the new home's long-term comfort and value. Combining tight construction with properly sized heating and cooling systems optimizes the home's comfort and performance while minimizing operating costs.